In Vietnam real estate market, there is an important thing you should note when you want to buy and invest in some kind of property in Vietnam. That is location. For all of Vietnamese and foreigners, “location” word is just a word of a definition. In this post, we will inform you more, out of that small word, about surrounding area of The Sun Avenue Apartment. You may know about District 2 of 2 year ago. But at the present, District 2 in Ho Chi Minh are not limited by just a accrossing Saigon River. It is opened by canal under Saigon River and all of area in District 2 becomes the surrouding area of Saigon Business Center. You just spend only few minutes to go to Benthanh Market. That is something so awesome about District 2 at the present. And many projects in District 2, including The Krista apartment, Sala premium Residence and The Sun Avenue apartment, changes their value to a very different stage. The stage of premium quality of living. The Sun Avenue Apartment is one of biggest projects of apartment in District 2. Here are the information about surrounding area. • Internal roads 16m alongside Mai Chi Tho Avenue, connecting The Sun Avenue Apartment to Van Minh Residence and Thanh My Loi Residence. • Internal road 19 meters in The Sun Avenue Apartment parallels Dong Van Cong Street. • The Sun Avenue Apartment is adjacent to Thu Thiem New Urban Zone (2 kilometers from the center), takes 3 minutes to the center of District 1 and District 3 via Mai Chi Tho Avenue by Thu Thiem Tunnel. • The Sun Avenue Apartment is adjacent to some residential area has been formed and completed in infrastructure: City Horse 87 hectares, Van Minh Residence, Thanh My Loi residence and others. • To Administrative Center in 2-3 minutes from The Sun Avenue. • To Phu My Hung Urban Area 15 minutes by Phu My Bridge. 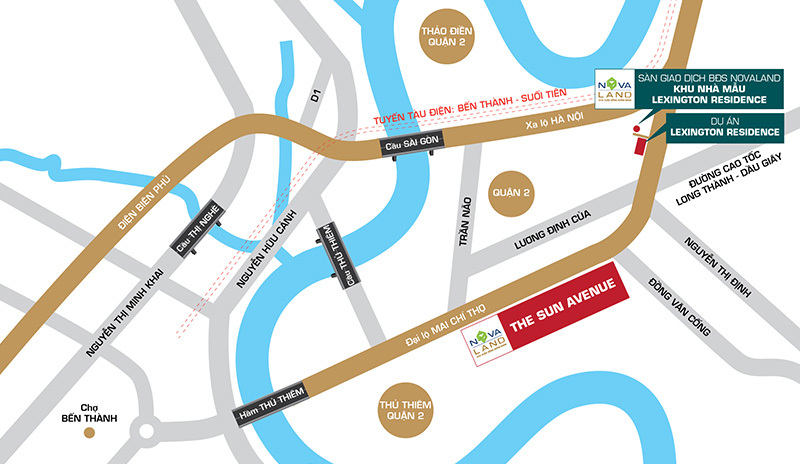 • The Sun Avenue Apartment near Long Thanh – Dau Giay Highways. • Near Ben Thanh-Suoi Tien metro subway.